Aaron contacted TheDiabetesCouncil with some questions related to diabetes and heart disease. Aaron is 57 years old. He has had Type 2 diabetes for 12 years. Aaron visited his doctor related to swelling in his ankles and feet, shortness of breath, and weight gain. After some tests, the doctor informed him that on top of his Type 2 diabetes, he now has congestive heart failure. He was now wondering why did he have heart disease now and was it because of his diabetes? 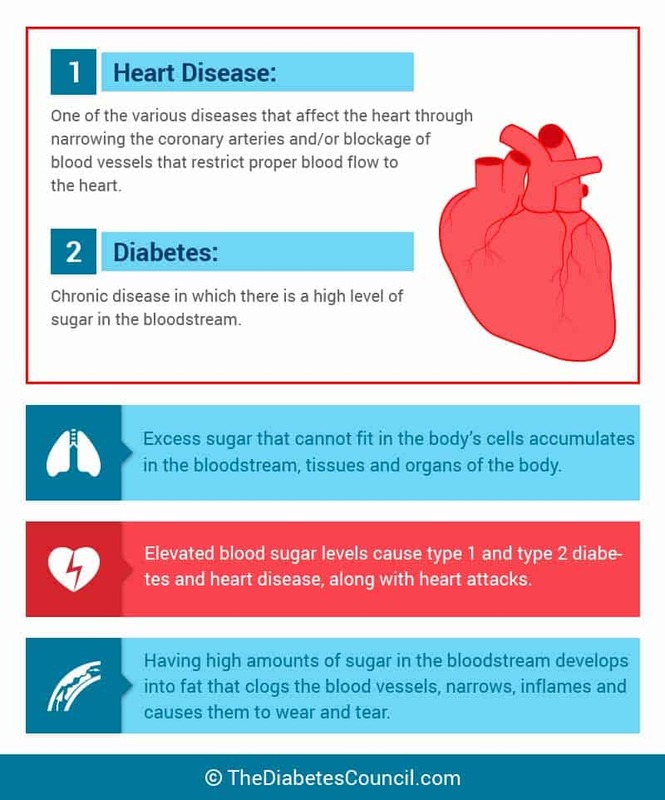 In order to help Aaron and other people with diabetes understand the connection between diabetes and heart disease and how to prevent it, we decided to look into the specific link between the two diseases. What is the connection between diabetes and heart disease? 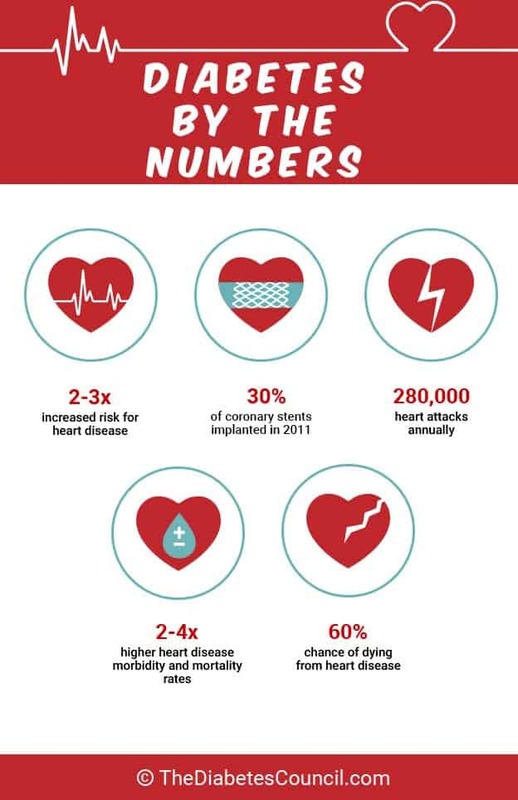 According to the American Heart Association, there exist a relationship between cardiovascular disease and diabetes: 68% percent of people with diabetes who are aged 65 and older die from heart disease and 16% die of a stroke. People with diabetes are more likely to die from a heart disease than those without diabetes. In two words, the connection between diabetes and heart disease can be summed up related to “high glucose.” It has often been said that diabetes is not the problem, and that it is the high glucose in the blood that is the problem. Indeed it is high glucose levels that cause more problems as the condition wreaks havoc throughout bodily organs. Blood vessels of all types and sizes get damaged from high glucose. 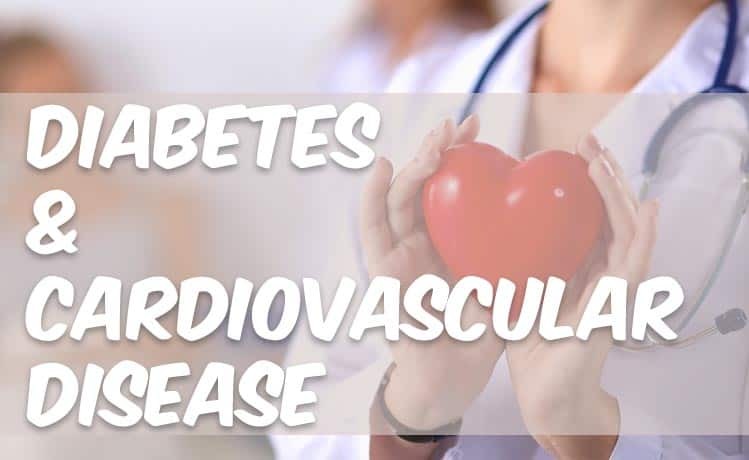 From the tiniest blood vessel in the tips of your toes to the largest blood vessels in your heart, high blood glucose provides the connection between heart disease and diabetes. In addition, high glucose over time also causes damage to nerves throughout the body. Compare it to a car that someone has put oil into the gas tank instead of gasoline. The thick viscosity of the oil sticks to the side of the pipes, and clogs up the pistons in the engine. The engine is then compromised from the thick oil running through it. It can’t run like that, and it just gives out. It’s the same with the sugary sweet, thick blood from high glucose. The blood is sticky, and it sticks to the sides of veins and arteries, causing atherosclerosis or hardening of the arteries. No blood vessel is left unscathed. The blood vessels in the tips of your fingers and toes are affected, as are the larger vessels throughout the body, and vessels within organs, including the heart. Eventually, this causes problems with the organs, and they are compromised. The end result is organ and circulatory problems that can lead to organ failure, and death. Can An Exercise Physiologist Help With Your Diabetes? If you have uncontrolled diabetes for a long time, you are twice as likely to develop heart disease at a younger age. In adults with diabetes, heart disease is the most common cause of death. People with diabetes often have comorbidities that increase their risk of heart disease and stroke. These comorbidities are high blood pressure and high cholesterol, which often go hand in hand with diabetes. Therefore, it is important to manage blood glucose if you have diabetes, along with high blood pressure and cholesterol as well to prevent heart disease. Does diabetes put me at an increased risk of heart disease or stroke? As previously mentioned, it is not so much the diabetes as it is high blood glucose excursions. People with diabetes are twice as likely to have heart disease as their peers without diabetes. Also, when you have diabetes for a number of years you are more at risk for heart disease. 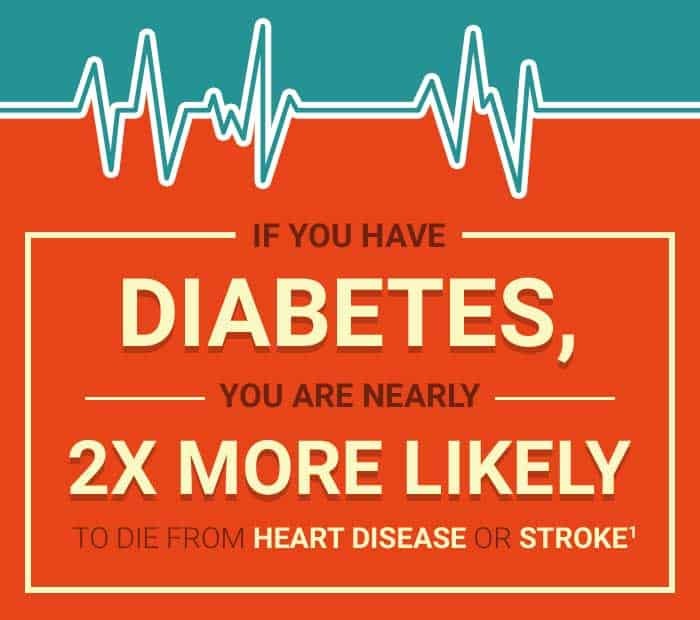 Diabetes is definitely a risk factor for heart disease. Once you are diagnosed, you do not have to accept the fate that you will one day have heart disease or have a stroke. The way that you manage your diabetes is the most important factor in determining whether or not you will have heart disease or a stroke down the road. If blood sugars remain elevated over time, it affects your body’s blood vessels, including all veins and arteries in your body that go to all organs in your body. Therefore, if you keep your diabetes well-managed, you can avoid heart disease and stroke as related complications. However, if you have had diabetes for a long time, and you have had trouble managing your diabetes and keeping your A1C, cholesterol numbers, and blood glucose in target, then you will be more at risk for heart disease or stroke. 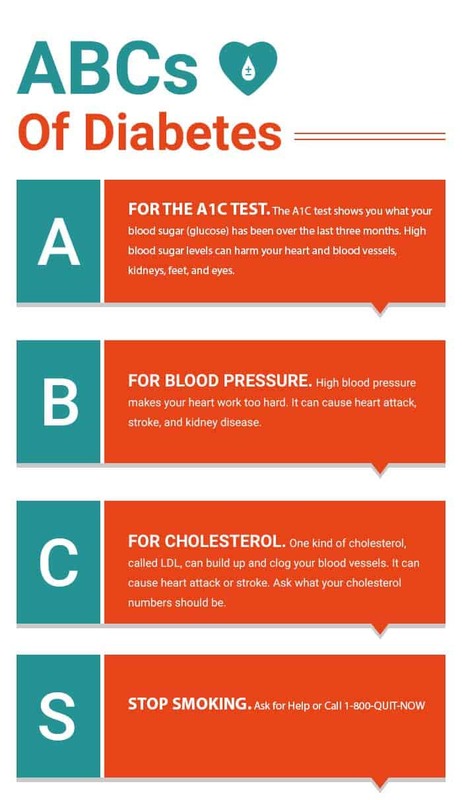 A for the A1C test – The higher your numbers, the higher your glucose levels are. High levels of glucose in the blood can bring harm to your heart and blood vessels (along with your kidneys and eyes). B for Blood pressure – Your blood pressure, as a person with diabetes, must be below 140/90 mm Hg. Check with your doctor what yours should be at. C for Cholesterol – As this article mentions, too much of bad cholesterol can be the cause of your heart attack or stroke. Check with your health care team as to what your appropriate cholesterol numbers should look like. S for Smoking – we cannot stress enough how injurious smoking is to health overall but even more so for people with diabetes. Smoking, along with having diabetes, narrow blood vessels which forces your heart to work harder. Why does diabetes affect the heart and vessels, leaving a person more at risk for heart disease or stroke? Unmanaged diabetes leads to complications. Two of the complications are heart disease and stroke. If a person with diabetes does not take measures to control their blood glucose, and to keep their blood pressure and cholesterol down, they may find that they have developed heart disease, or are at a greater risk of stroke due to the damage this does to their blood vessels going to their heart or brain. It is also important to manage blood pressure and cholesterol. As modifiable factors, a person can work on lifestyle changes to decrease blood pressure and cholesterol. High blood pressure makes the heart work too hard, and can damage vessels thereby increasing heart disease and stroke risk. High blood pressure also can cause vision problems and kidney problems or failure. Cholesterol is sometimes a modifiable risk factor, and sometimes it is not. When high cholesterol is hereditary, or runs in families, it can be harder to get cholesterol numbers in a normal range. For total cholesterol, you will want to keep your numbers below 200. The LDL, or low density lipoprotein number (bad fats) should be less than 100, and the HDL (High density lipoprotein) should be greater than 50 (HDL is often low, and triglycerides high, in type II diabetics – adding more risk to the patient.) Triglycerides should be less than 150. You may try dieting and exercising to lower cholesterol numbers, and eating foods which are low in saturated fats, and avoiding Trans fats in your diet like those that raise Triglyceride levels. If it doesn’t do the trick, you may need cholesterol medications to lower your numbers. Speak with your primary care provider about how to best keep your cholesterol numbers in check. Let’s break down the different cholesterol numbers, and what they mean, a little bit more below. Cholesterol is liver fat that makes it into your bloodstream. There are two kinds of cholesterol for you to be familiar with. There is LDL (low density lipoprotein), and triglycerides. LDL refers to “bad cholesterol,” or big blobs of liver fat that float in your blood. This is the one that can clog up your blood vessels like grease can clog up your sink drains. High LDL presents a problem for heart disease and stroke risk down the line. They raise a person’s risk of heart disease when they are elevated. Triglycerides are another kind of liver fat that gets in the bloodstream. Some people have inherited high triglycerides, and it is extremely difficult to lower their triglycerides even with medications. However, every measure should be taken to lower triglycerides to protect heart health. Other modifiable factors such as smoking and being overweight can be changed, and people with diabetes should seek help in order to lose weight or quit smoking if needed. Being overweight increases the insulin resistance in Type 2 diabetes, and smoking further compromises circulation on top of the problems causing high blood glucose in diabetes. Smoking decreases circulation to the extremities, making it more likely for a person with diabetes to develop an ulcer that won’t heal that leads to an amputation. The things that you do to manage your diabetes will help to decrease your risk for heart disease and stroke, and all of the complications of diabetes. Smoking increases vasoconstriction in blood vessels. The nicotine in cigarettes binds with the oxygen in the bloodstream, keeping needed oxygen away from cells, tissues, and organs in your body. The single thing that you can do to help your health and your diabetes is to quit smoking. There are many programs available out there to help you Quit. Many states have their own quit line, and they will counsel you and mail you patches, lozenges, or nicotine gum to help you quit. There are also several medications out there to help you quit smoking. Wellbutrin and Chantix have been shown effective with helping people to quit smoking. Alcohol raises triglyceride levels. For people with diabetes, alcohol can also cause a low blood glucose up to 48 hours after consuming an alcoholic beverage. Therefore, it is best for people with diabetes to stick to 1 or 2 alcoholic beverages with their meal in order to avoid low blood glucose. For those with high triglycerides, it is best to avoid alcohol altogether. Being overweight puts us at greater risk of lots of health problems, including heart disease, stroke, and high blood pressure. Developing healthy eating habits, like planning ahead and grocery shopping for appropriate healthy foods, watching portion sizes and fats, and getting active can all can help you to lose weight if you are overweight. Speak with your primary care provider about special programs in your area to help you lose weight. What about that beer belly? Even if you are a normal weight for your height, excess weight in the abdominal area can put you at a higher risk for heart disease and stroke. Excess belly fat is a factor when the waist is more than 40 inches for a male, and more than 35 inches for a female. Core exercises may help you too lose any unwanted belly fat. If you have a lack of physical activity, it can put you more at risk for heart disease. The recommended level of physical activity is 150 minutes per week. That can be broken up into 5- 30 minute increments of exercise, or smaller increments. The important thing is to get moving. Walking is a suitable exercise for most people. Speak with your primary care provider to discuss a suitable exercise program for you. This is one risk factor that you can modify. If you have diabetes, keeping your A1C below 7 percent for most people is a goal. You can achieve this by learning to keep your blood glucose in a target range. See your local Certified Diabetes Educator for help with diet, exercise, monitoring your blood sugars, your medications, and more. You can find one in your area here: https://www.ncbde.org/find-a-cde/. You can enter your zip code to search for Diabetes Self-Management Programs in your area. There are certain things that we just can’t help. One of those is a family history of heart disease or stroke that puts us at an increased risk. You should especially know about other family members who had a heart attack at a young age, or before age 50. However, it gives you the heads up for what to look out for in the future, and may motivate you to make healthy changes and to keep a check on your blood pressure numbers. Stress over the long haul can take a toll on your blood pressure and your blood glucose. Both will rise with your stress level, so it’s important to find a healthy way to cope with stress. Stress is a modifiable risk factor for heart disease. First, you must be self-aware and know what triggers your stress. You may find that it is harder for you to get to sleep and stay asleep, that you drink alcohol or use substances more, are irritable and easy to anger, are feeling more depressed, or find that you have a lack of energy. If you are not able to cope with stress, and you are feeling that you could hurt yourself, do not hesitate to call the National Suicide Prevention Lifeline: at 1-800-273-TALK (8255), available 24/ 7. Calls are kept confidential. A total of 1501 patient study conducted by Sheperd et al emphasized on the importance of lowering cholesterol in a person with diabetes. Atorvastatin (a cholesterol-lowering medication) was given to all the participants, who had diabetes and Coronary Heart Disease (CHD) with levels of LDL very high. This significantly reduced the rate of any major cardiovascular event from occurring by 25%. If you are already counting your carbohydrates, watching saturated and Trans fats, and generally are on a diet for diabetes, then you are already following a heart healthy diet. Diet is one modification to lifestyle that we can make in order to be more heart healthy. Getting active at least 30 minutes per day, 5 days of the week should be a goal. Watching your sodium or salt content of your meals may also help you be more heart healthy. It is estimated by the CDC that 9 of 10 Americans get too much salt in their diet. Looking for 1 serving of food to contain less than 240 mg of sodium or salt will help you to stay within the guidelines of 1500 mg per day (which is only half a teaspoon!). What causes diabetic heart disease? The process by which a person with diabetes gets heart disease is complex. There are four actual processes that together or alone can cause Diabetic Heart Disease. When plaques build up in the arteries, it is a disease process known as atherosclerosis. Research studies show that this process may even begin in childhood, which makes the case for good nutrition early on. As you age, you can get more plaques building up in your arteries. Several factors can lead to Diabetic Heart Disease, including smoking, increased levels of fat and cholesterol in the bloodstream, high blood pressure, and high amounts of blood glucose due to insulin resistance in Type 2 diabetes. As time goes on, the plaques get harder, and block blood flow partially by narrowing arteries. Then you are not getting enough oxygen to your heart. Areas can break open, causing fragments from the blood cells to stick together and form a blood clot. A blood clot will narrow the artery further and limit oxygen. This can give the person with diabetes chest pains, or angina, or in worst case scenario, may cause a heart attack. Metabolic syndrome account for raising the risk for heart disease and Type 2 diabetes. Metabolic syndrome is defined by 5 risk factors. If a patient has three or more, they may be diagnosed with metabolic syndrome. Being obese is a risk factor for metabolic syndrome. There is also sometimes chronic inflammation somewhere in the body. Consequently, this inflammation may cause metabolic syndrome to get worse. In Type 2 diabetes, the body becomes insulin resistant. Though the pancreas still makes some insulin, the insulin that is made is not used properly. The end result is high blood glucose. It has been proven that people with Type 2 diabetes have properties in their blood that leads to increased clot formation. This results in an increased risk for coronary artery disease, a heart attack or stroke, or even death. In a study by Grundy et al, Diabetes and Cardiovascular Disease, it is strong stressed that smoking, hypertension, renal disease are a risk factor along with Coronary Heart Disease. The research demonstrates that treatment of hyperglycemia reduces microvascular complications of type 1 diabetes. Therefore, patients must avoid the use of tobacco, maintain healthy blood pressures, reduce intake of triglyceride fats in order to achieve goals of preventing cardiovascular complications. What heart conditions do people with diabetes get most often? Coronary Heart Disease (CHD) is another medical term for hardening of the arteries, or atherosclerosis. Plaques build up inside the coronary arteries carrying oxygen to your heart. When this happens, the arteries are partially blocked or completely blocked. When arteries are narrowed, a person may experience angina, or chest pains. Angina pain can occur in your shoulders or arms, or in your neck or back. It may feel like stomach upset. When the arteries are blocked off completely, a person can have a heart attack. With a heart attack, oxygen is cut off to a part of the heart. In this case, blood flow must be restored, or part of the muscle will die. Time is of the essence, because without emergency treatments, the person may die. CHD weakens the heart over time and can lead to problems with the heart’s rhythm and rate, called “arrhythmias.” A person can also develop Congestive Heart Failure. CHD which weakens the heart muscle can lead to more problems such as heart failure and arrhythmias. When you have a heart failure, your heart can’t pump enough blood to meet your body’s needs. Arrhythmias are problems with the rate or rhythm of the heartbeat. Congestive Heart Failure happens when the heart is unable to pump enough blood to meet the body’s demands. In cardiomyopathy, the heart muscle becomes enlarged, thickened, and rigid. In severe cases of cardiomyopathy, healthy heart tissue can be replaced with scar tissue. There are many causes of cardiomyopathy, with diabetes being one risk factor. A thick, enlarged, and rigid heart muscle is an ineffective pump. The electrical rhythm of the heart gets confused, and arrhythmias, or irregular heartbeats and heart valve problems can occur. Cardiomyopathy can be hereditary, or it can be acquired due to a chronic illness such as diabetes. It’s important to know the warning signs of a heart attack and stroke. Time is of the essence. The first step is to call 9-1-1 if you or someone you know is having symptoms of a heart attack or stroke. Related to a heart attack, treatment is best when given quickly. Some symptoms may be obviously heart related, while others are not so obvious. A person may have some of these symptoms, but they may not have all of them. For angina, or chest pains where the patient takes nitroglycerin, a person with diabetes may not notice their chest pains due to diabetic neuropathy, or nerve damage from diabetes. Angina is not a heart attack, but it increases a person’s risk for a heart attack. For women, signs are not as specific. They can have pains in their neck, jaw, arms, or shoulders with no chest pain. They may feel tired for days, and not equate the tiredness with a heart event. In their study, titled Coronary Artery Disease in People with Diabetes: Diagnostic and Risk Factor Evaluation, Dr. Cooper and Dr. Caldwell remind us that Coronary Artery Disease (CAD) is one of the causes of death in more than half of patients with diabetes. 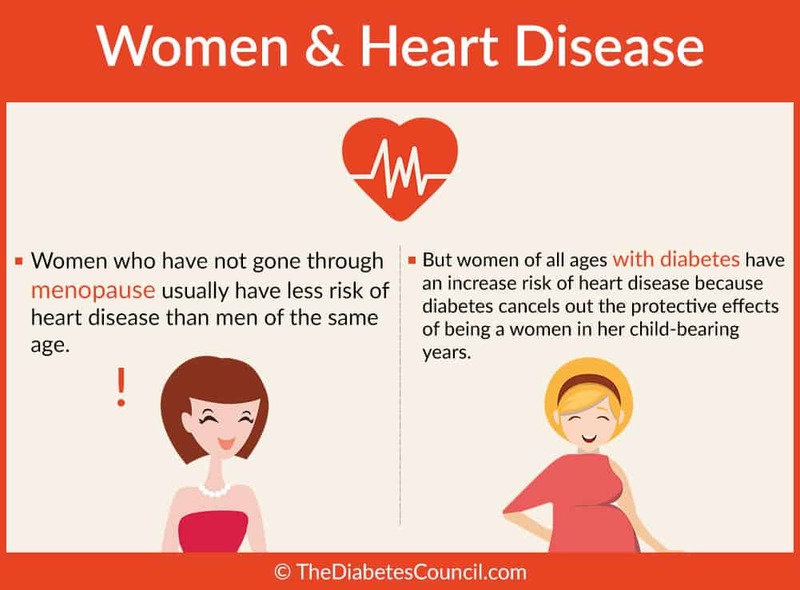 Women who have diabetes are at an even higher risk than women who do not. Early detection of CAD is imperative in order ensure that proper medical treatment is being provided. Patients with Type 2 diabetes should be screened at the time when they are diagnosed with diabetes. Once a year check up recommended in order to treat patients appropriately or to get a diagnosis early on. A stroke occurs following the death of cells in the brain that are deprived of oxygen. This is caused by a blood clot blocking the flow of blood in the brain, or when an artery ruptures in the brain. 9-1-1 should be called right away if you notice the signs of a stroke. To elaborate a bit related on stroke signs and symptoms, a person who has suffered a stroke may have weakness and/or numbness of the face, arm, or leg on one side of the body. Any weakness of one side of the body should be a cause for concern and suspicion for a stroke. The person’s speech may be incomprehensible, they may be confused, and you may have trouble trying to understand what they are saying. They may feel dizzy following a stroke, have a loss of balance or difficulty walking. Vision in one or both eyes may be affected. They may complain of a sudden or severe headache. If you can get the person to the emergency room within an hour of these signs, you can help prevent permanent brain damage, as there are medications that the emergency department can give them to dissolve the blood clot in the brain. This is why time is so important when a stroke is suspected. Prevention is the best defense, but if you find that you do have heart disease, or have a stroke related to your diabetes, there are treatment options. When you have heart disease, you will likely be taking medications. In the case of heart disease or stroke, medications are an important part of your healthcare plan. If you are trying to get your A1C, blood pressure, and cholesterol down, it’s likely that you are taking medication for this. Ask your primary care provider if you should be taking an aspirin. It’s not safe for everyone, so be sure to ask. The provider may prescribe a baby aspirin (81 mg), or a regular dose aspirin (325 mg). Aspirin can help prevent blood clots from forming. Aspirin also helps to keep blood clots from forming in the brain, thereby decreasing stroke risk. If you have already had a blood clot, you may be placed on other types of blood thinners that are more powerful. You may be taking Coumadin (wharfarin sodium), Pradaxa (dabigatran), or Xarelto (rivaroxaban). These medications are powerful anticoagulants and reduce your chance of developing another blood clot. If you take Coumadin, you will likely have blood work to check your clotting time weekly, or biweekly. You may go to the provider’s office to have the blood drawn, or you may have home health provider to come and do it for you. You also may be taking statins for high cholesterol numbers. These can reduce the risk of a heart attack or a stroke for people with diabetes. Discuss with your provider if you think that you might need to be taking a statin medication for your cholesterol. Some examples are Pravachol (Pravastatin), Crestor (Rosuvastatin), and Lipitor (atorvastatin). Chest pain is a symptom of heart disease, and can be an early heart attack symptom. You will want to treat angina with Nitroglycerine tablets as ordered by your provider to treat chest pains. There are many different kinds and types of blood pressure medications. Control of blood pressure is important. High blood pressure makes our heart work harder, therefore if your provider wants you to take medication for your blood pressure; you should take it as directed. There are too many different kinds of blood pressure medications to name them all. Fluid pills may be prescribed when you have Congestive Heart Failure to get rid of the excess fluid that builds up around your heart in congestive heart failure. Fluid pills also take fluid off the extremities. One common fluid pill is Lasix (furosemide). When the heart has an irregular rate and rhythm, it is called “arrhythmia.” One example of an abnormal heart pattern, or arrhythmia, is Atrial Fibrillation. With this condition, atrial fibrillation (AFib) is a type of arrhythmia, or abnormal heart rhythm. 2.7 million people in the United States have arrhythmia of the heart, according to the American Heart Association. For people with Atrial Fibrillation, the upper chambers and the lower chambers of the heart do not beat in sync with one another. Blood pools in the chambers, as the ineffective pumping of the heart cannot clear all of the blood out of the chambers. This places a person at risk for blood clots that could dislodge and go to the brain, causing a stroke. Beta blockers, generally for blood pressure, help control the rate and rhythm of the heart, and also help to keep blood clots from forming. As previously said, time is of the essence when you have had a stroke. Seek emergency treatment right away. If you arrive at the Emergency Room, and you are given tPA, also called IV rtPA quickly, the drug may be able to dissolve the blood clot, thus improving blood flow to the brain. This can greatly decrease the damage done from a stroke. tPA stands for “tissue plasminogen activator,” and it is given to the patient IV. Treatment for a stroke is of the utmost importance, and timing for tPA must be swift in order to minimize brain damage from the blood clot. A person can die from a stroke, so the first goal of treatment is to save the person’s life. Then emergency medical personnel can work to relieve symptoms, and repair the source of the bleeding in the brain. The first level of treatment for the most part occurs in the Intensive Care Unit of the hospital. The next goal of treatment is to prevent further brain damage. By controlling the person’s blood pressure and preventing the brain from swelling by giving medications. Seizure medications may need to be administered. The patient will need to rest until the risk of rising intracranial pressure is over. Then they will need to start rehabilitative efforts for the person as soon as they are able to work with therapists. They may see a Physical Therapist, an Occupational Therapist, and a Speech Therapist during their rehabilitation, depending on how their brain was affected by the stroke. Your primary care provider will take a detailed history of your medical conditions, and of your family’s conditions. He or she will look at your personal health history, and perform a physical examination. The primary care provider may order tests and procedures to determine if you have heart disease based on your symptoms and also on your A1C, blood pressure readings, and cholesterol values. This test will measure and record the electrical activity of the heart. This test will let the provider see the heart rhythm, and whether or not it is irregular. An EKG shows how much strength does the heart has for sending electrical signals. Heart damage from Coronary Heart Disease or a prior heart attack can be seen on the EKG. It is a simple and painless test that can give your provider much information about your heart! A stress test is a test which is performed while exercising, usually on a treadmill. The purpose is to get your heart beating faster and working very hard. The patient is hooked up to heart monitors. If unable to exercise, the patient may be given medications in order to increase their heart rate. If there is plaque build-up in the arteries, you may not be getting enough oxygenated blood to the tissues in order to meet your heart’s need. A stress test can show Coronary Heart Disease, including problems with the rate, rhythm and electrical activity changes, or blood pressure, chest pains, and /or shortness of breath. They may or may not take pictures of your heart at work and at rest as part of the stress test. This type of “imaging stress test” shows blood flow throughout the heart, and also shows the efficiency with which your heart pumps blood. This test uses sound waves. It provides a picture of your heart, and gives information about the size and shape, and the inner workings of the valves and chambers. It may also show areas of “ischemia,” or poor blood flow. It will let the doctor know if there has been any injury to the heart in the past from plaque build-up or other factors. With a chest X-ray, you will get a picture of the heart, the lungs, and all of the vessels going to and from the heart. The doctor can often pick up on heart failure, and lung diseases. The provider can order lab tests that check the fat content of your blood, cholesterol, blood glucose, and proteins. If you have abnormal lab results, it could mean that you are at risk for CHD. Lab tests may also pick up on whether or not you are anemic, which puts you at risk for CHD. Elevated protein levels may indicate that there has been a cardiac event that has caused some heart muscle cells to die. When they die, they release protein into the blood. High levels of protein in the blood indicate that there has been a heart attack. If your doctor wants to look inside of your coronary arteries, then you will probably have a cardiac catheterization ordered, with coronary angiography. The test uses IVP dye and X-rays to visualize the coronary artery network. The dye is introduces via cardiac catheterization. In this process, the cardiologist places a small tube or catheter into the vessel of your groin, arm, or neck. The tube gets moved into the coronary arteries, at which point the dye is injected so that the cardiologist can see the inner workings of your heart. During this procedure, X-rays are taken while the dye is highlighting the vessels in the heart. Other tests can be performed during cardiac catheterization that check artery thickness, and also check blood flow in the minor or small arteries of the heart. This is a questionnaire that looks at your ability to perform routine tasks. It provides information to your provider about how well your heart handles blood flow through its arteries. This test also measures blood flowing through your heart. It uses radio waves, magnetic forces, and computer graphics to draw pictures of your heart beating. The pictures are still and moving, so the cardiologist can get a good visualization of your heart. How do I know if I have heart disease? If you are experiencing any of the symptoms of heart disease outlined in this article, you should see your primary care provider to perform tests related to your heart health. Take any signs and symptoms of heart disease very seriously. How can I prevent or delay heart disease with diabetes? 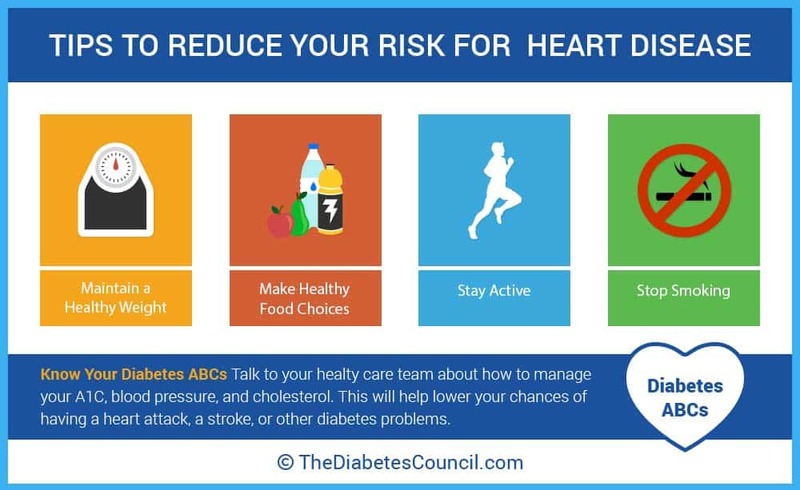 You can prevent or delay heart disease with diabetes by managing your A1C, your cholesterol, and your blood pressure, and working to keep them in a good range. Staying active, eating heart healthy, and taking all of your medications as prescribed is also important for heart health when you have diabetes. Will I be more prone to have a stroke with diabetes? As diabetes is a risk factor for stroke, controlling your diabetes, including your A1C, and controlling your cholesterol and blood pressure will help you to avoid a stroke. How can I eat heart healthy with diabetes? The good news is that a diet plan for diabetes is perfect for a heart’s health. Since you are already watching carbohydrates, eating lower fat foods, fresh or frozen fruits and vegetables, lean meats, and whole grains, it’s not much of a stretch to eat heart healthy. In fact, if you are already doing a good job with your diabetes nutrition, you will not have to change a thing to eat heart healthy. Does obesity play a role in increasing heart disease risk? Obesity does play a role in heart disease risk. Learn how to measure your waist. If you are a male, and your waist is over 40 inches, or a female and your waist is over 35 inches, then you are at risk for heart disease. If you want to find out if your waist is over the cut-off for heart disease risk, you can learn how to measure your waist here: Learn how to correctly measure your waist. Does obesity cause diabetes and heart disease? Being obese puts you more at risk for developing high blood pressure, Type 2 diabetes, and hardening of the arteries that leads to problems with the heart. As a person’s Body Mass Index increases, so does their risk for heart disease. It is certainly a risk factor, if not the cause of diabetes and heart disease. Am I at risk for heart disease if I have gestational diabetes? Pregnant women with gestational diabetes do have an increased risk of heart disease, according to the Journal of the American Heart Association. Why is heart disease the leading cause of death for people with diabetes, or why is it so common among those with diabetes? With diabetes, you often have high blood pressure, high cholesterol and high LDL (bad) cholesterol. Years of poor management of high blood glucose, high blood pressure and cholesterol numbers takes it’s toll on the heart in what amounts to a triple risk. This is why heart disease is so common with diabetes. Thanks for the informative article about diabetes and cardiovascular diseases. It’s interesting to think that people are more likely to develop a heart disease early on if they happen to have uncontrolled diabetes. Definitely sounds like it’s important to understand more about the conditions you may have as soon as possible, so that you can do what is necessary to live a long, healthy life. Very thorough and informative. Thank you. All of my questions for my mother were addressed. I now know what my next steps are to help slow down these disease processes.